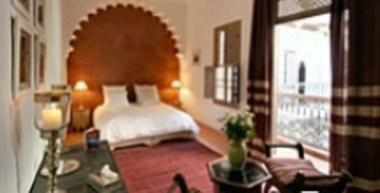 Riad Altair is located between no less than 3 of the best restaurants in Marrakesh, at 21, derb Zaouia - Mosquée de Bab Doukkala. We are located just 100 metres from the Bab Doukkala mosque, a 3-minute stroll from the bazaars and 10 minutes on foot from Jemaa el Fna square. From high on the roof terrace, you have a 360° view of the Red City, while the patio and pond are a cool oasis in the heat of the day. We offer 6 comfortable accommodations. We organise private functions of all kinds (birthdays, events etc).